I love teaching the subject of improvisation. It’s a big, scary concept for new dancers, yet in reality it’s quite easy to do. Even after only a couple of months, beginners can take the simple moves they know into “social dance situations” like haflas and other belly dance get-togethers. It’s easy to say “just dance to the music”, but in reality many people come to belly dance class with no idea about “music interpretation”. Of course good teachers cover that subject in class, but new students deserve an easy path into the belly dance world - a simple one, two, three formula that works - so they can enjoy the dance (and dance class) without feeling like they’ve signed up for a course in academics. Let’s see how we can take improvising and make it easy, yet still true to the best expression of the art of belly dance. Since our dance form is so much about shapes - circles, squares, spirals - then looking around at your world is often enough inspiration for in-the-moment dancing. If you look around where you are right now you see shapes: straight lines, designs, triangles; contrasts of light and shadow, big and little. Copying shapes around us is a way to start dancing; it can trigger your belly dance movements, and works even if you haven’t learned any music interpretation. In beginner class I teach students about straight-line movements, sometimes called slides, extensions, lifts, sharp moves or what have you. We also learn about round moves, which may be called circles, smooth shapes, etc. If students can absorb what they learn in two or three different ways it speaks to them holistically. It’s like thinking with the body or feeling with the brain. If students are lucky enough to have a teacher who does introduce musical concepts in the classroom then they’re ahead of the game. It doesn’t have to be intellectually heavy - just hearing the beat and shifting weight in time with the music can serve to trigger your hip moves and belly dance steps. 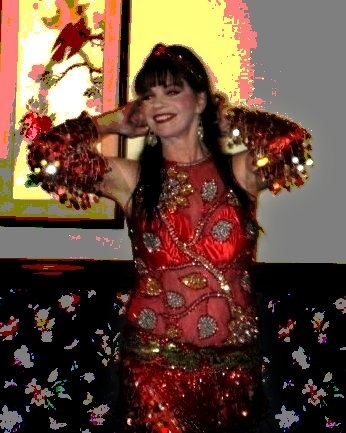 One of my favorite things to do with belly dancing is to focus on the beat and rhythm, moving with it and feeling my weight shifting while I move the center of gravity around my body. It’s delicious! But How Do We Make It Beautiful? In beginner class sometimes I demonstrate what dancing looks like with bad posture - I’ll do a hip lift with a sunken chest, lazy arms, and awkward hands. Then I lift my chest, extend my arms, position my hands correctly, and do the same hip lift. Now it looks good - and students can easily see the difference - they understand what made it look better! Yes, even beginners, new students, can be beautiful when they dance, once they understand how. - Smile: and actually focus on how good you feel, how happy you are. The wonderful thing is it’s like magic to anyone lucky enough to be watching you! They’ll feel better too and enjoy your dancing even more. Use these basic building blocks of dance as stepping stones into improvisation, and develop “the dancer’s way of thinking”. Above all, enjoy your improvisation, and revel in your ability and freedom to belly dance!